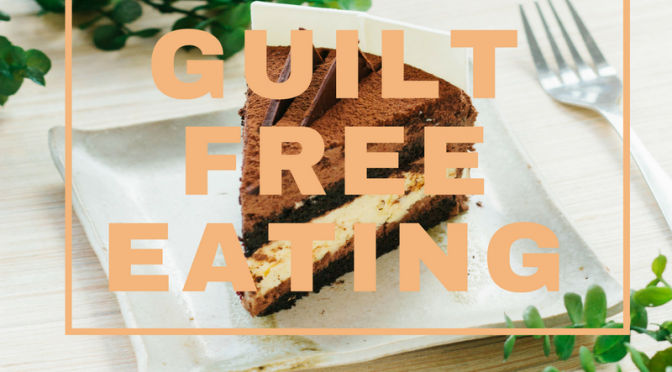 It got us talking about why there is guilt associated with food. Such a huge and emotive topic. 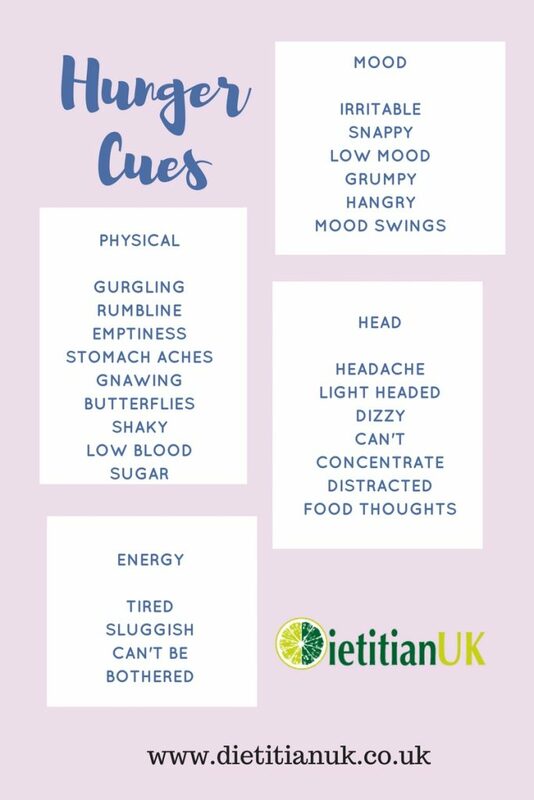 We all know that food is something our body needs, without it we cannot live, too little food and we lose weight, not eating a balanced diet means our body does not function correctly and can be physically unwell. So where does the guilt come from? 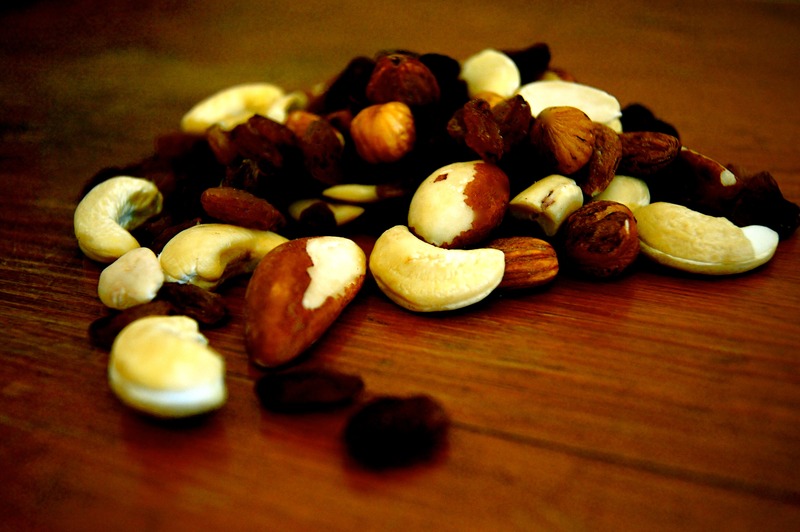 From an early age we learn that some foods are not as good for our bodies. This is often taught in a very black and white manner, labelling foods as good or bad. Now I would agree that something high in calories, fat and sugar, like a slice of chocolate fudge cake, is not something we should be eating daily. However it isn’t a bad food… on the contrary it is delicious and can bring a lot of pleasure. Eating for pleasure is important. Lots of our experiences are associated with food. If we only ate for our physical need think of all that we would missed out on. For example the pleasure of an ice-cream on a hot day or cake at a birthday. These experiences feed our soul, they are part of our social life and our emotional well being too. Food is more than just nutrition. 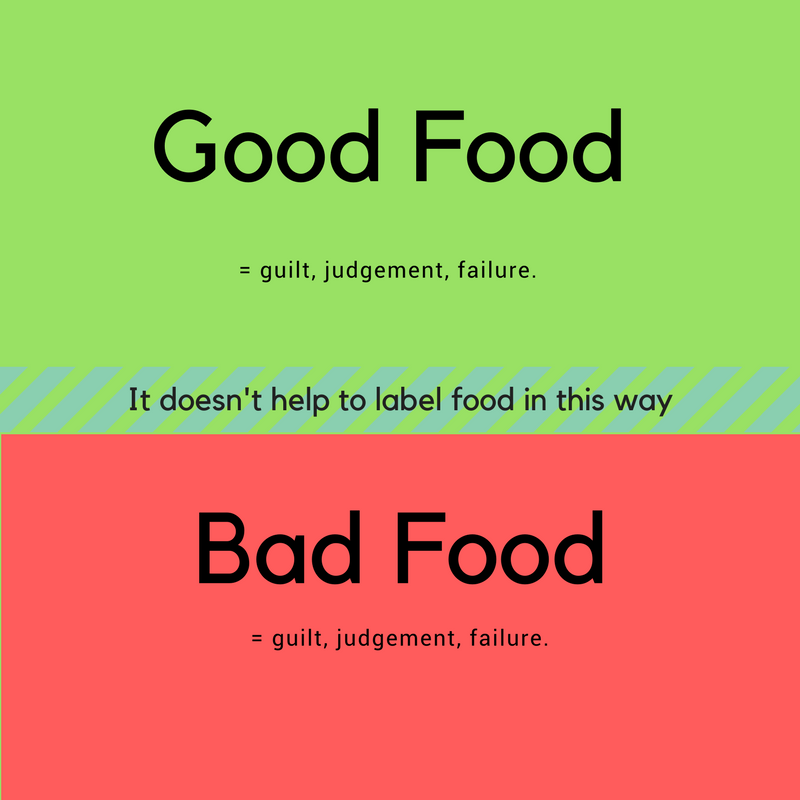 When we label a food as good or bad it affects the way we think and feel about it. So by labelling that slice of cake as “bad food” we feel we are being naughty/bad when we eat it. It can lead to anxiety before eating, judgement, criticism and then guilt afterwards. Our food rules therefore hold a lot of power and influence. Having just worked with a TV production company on a food show, this topic also came up when they wanted to label a group of foods as good/bad. This instantly brought a red warning flag up in my mind. It became a great opportunity to talk about some other ways we could soften the language used and how powerful our words can be. This is definitely a journey I am on with my language both at home and as part of my work. It is time to change the way we categorise foods. Instead of good and bad can we not see all foods as back on the menu, just some more occasionally than others? This is not an easy, overnight change but one that requires practise, patience and plenty of self compassion. The first step is to identity how you see foods, then try to catch those moments when you pass a judgment on a food or on your eating. Can you step in and reframe it. Instead of “I shouldn’t have eaten that ice-cream, now I feel guilty, it is bad for me” Rephrase it as “That ice-cream was really delicious and brought me a lot of pleasure”. Let’s bring all foods back onto the menu and start working towards loving our foods and ourselves. Having an Eating Disorder over Christmas. 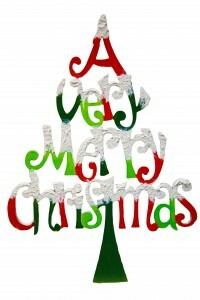 I love Christmas and all the build up that goes with it, I’m like a small child with the excitment of it. For me it is special celebration. However through my work in eating disorders I know what a hard time it can be for some. Christmas brings with it a lot of socialising, which can mean a lot of different meals. Eating in restaurants, buffet events, and more alcohol than usual. Then we have all the delicious, but high calorie festive foods: mince pies, christmas cake and pudding, stollen, pannetone, yule log, pastry items, cheese, nuts and those tubs of chocolates. 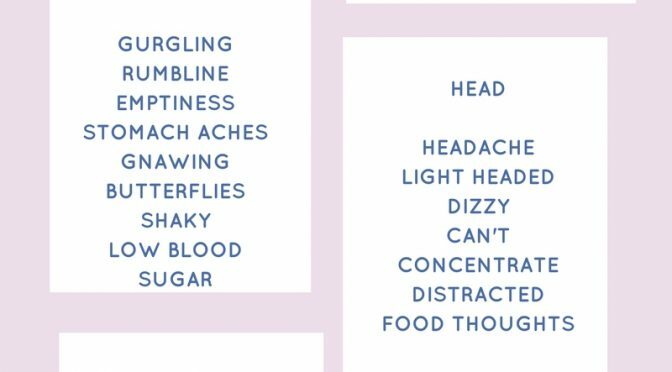 All of this can cause someone with an eating disorder a lot of anxiety and that is before we get to the Christmas meal itself. I know I will freak out over buffet food but I really want to go, what can I do? How can I eat in front of other people? Should I cut my intake down the rest of the day if I am eating out? How much can I drink and how does it affect my calories? The 25th December. A special day, spent eating, drinking and being around people you may not see all the time. In our family we end up having 2-3 Christmas days as we visit my side of the family and hubby’s side to celebrate with them too. So it could end up being 3 Christmas meals. Suddenly you are in an environment where you may eat at different times, have higher calorie foods at meals that you haven’t eaten for a while and are eating with different people. Will everyone be looking at me and watching what I eat? 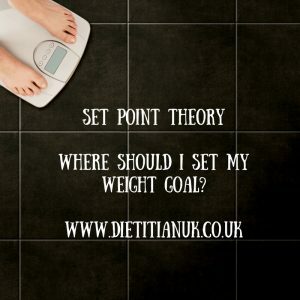 If the Christmas meal is late what do I do about sticking to my usual meal plan? How much should I have at that meal, will it be more calories than I am used to? What will this do to my weight? I don’t want to spoil the meal/day for everyone but how what do I do if I am not coping? 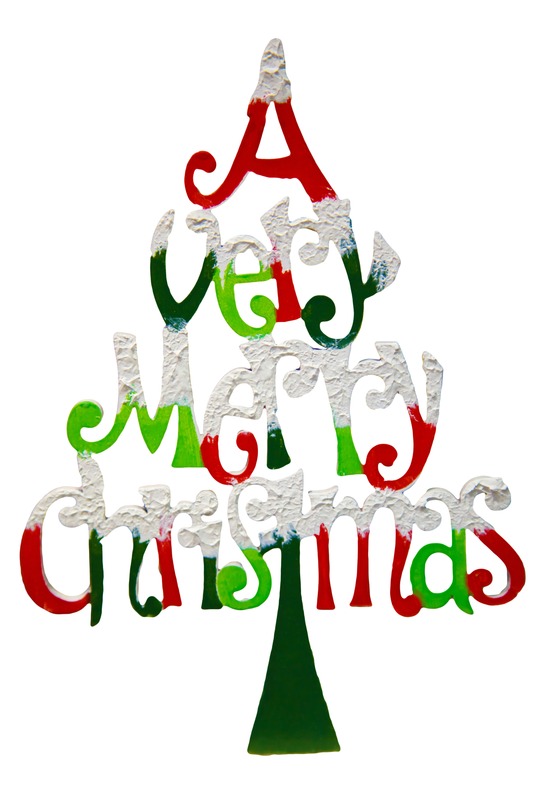 This year, I have spent time with each of my clients talking through their plans for the build up to Christmas. It’s been a real challenge for some with meals out with work colleagues and planning the Christmas Day itself. However everyone has a plan in place and I hope everyone will be able to relax a little and enjoy the moment. Preparation is key. Try to get as much information about what is going to be happening in advance. If you take some of that element of surprise out of the equation you will reduce the anxiety somewhat. Ask others around you for support. Let someone know that you may find this meal/event tricky and if so this will be your signal and give them ideas of what they can do to help. Maybe they can distract you with conversation or use a few motivational phrases to boost your confidence. If people do not know about your eating disorder then they are unlikely to be watching you. If they are watching you then it is probably out of sheer intrigue. You could try smiling at them to show things are ok (even if they are not). Remember that this is a moment for you to enjoy and you don’t want to let little things get in the way of your recovery. Plan out which days you will be eating differently over the festive time. Then also plan out a list of foods you want to allow yourself to eat. When are you going to do this? Can you swap a normal snack for a mince pie? 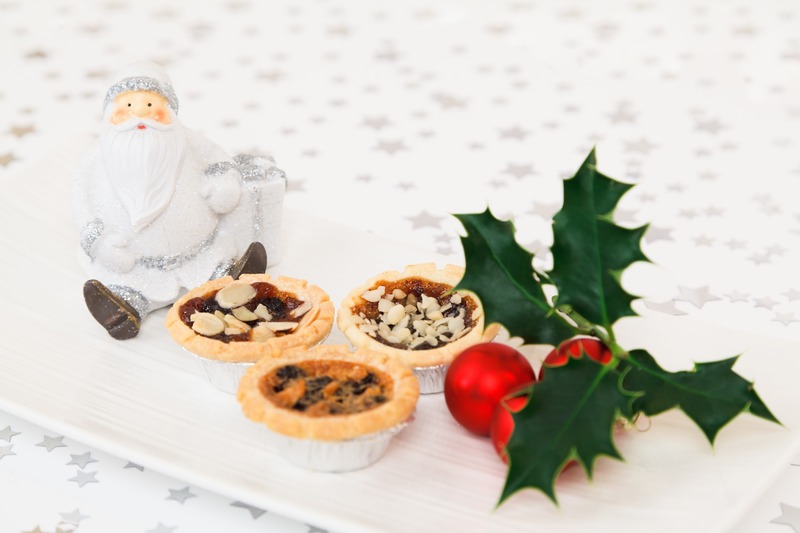 One of my clients worked out a mini mince pie was not that different to her usual cereal bar so that was an easy way to build a mince pie into her meal plan. Try not to let yourself miss out. The meal itself can be overwhelming. It is one meal out of 21 in a week. It is 1 day out of a week. If you eat an extra 700kcals that day, it only equates to an extra 100kcals every day that week – not enough to cause any effect on your weight. You need to eat an extra 250-500kcals everyday for your weight to increase, and even that is not enough for some people. The 80/20 rule – stick to your meal plan 80% of the time and you can come off your meal plan and relax more around food 20% of the time. It is a normal and healthful way of eating – for example think how people eat in a more structured way during the week but eat differently at weekends. Keep some meals on that big day safe and normal. It may be you can have a normal breakfast and morning snack but then you have a large lunch with dessert. Listen to your body and your wise thoughts. Check out those feelings of fullness – are they related to your emotional fullness, your anxiety or your physical fullness? Use your knowledge and common sense to decide what else you need to eat for the rest of the day. Restricting, purging or exercising after a big meal is not the answer. 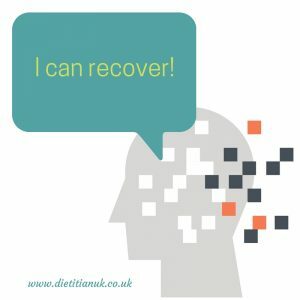 It may help you feel better initially but it won’t help your recovery in the long term. Find ways to distract yourself – crafty things can be good, get a mindfulness colouring book (all the rage right now it seems! ), phone a friend, hang out with that family member you haven’t seen in ages, suggest a gentle post-meal walk with people. Enjoy the moment so you can look back and be proud of you. Keep recovery in mind and keep going one meal at a time. If you need any support get in touch and we can set up a face to face or Skype consultation.